Lifestyle photography tells the story of you and your loved ones. This beautiful style of photography focuses on love and connection. Instead of stiff posing, the goal is engage with your loved ones, make memories together - while we document those candid moments in camera. We encourage lots of playing, laughing and cuddling. Our photography isn't about having everyone looking at the camera with forced smiles and perfect hair and clothes. It's about capturing those authentic moments that make your family special. What kind of lifestyle sessions do you offer? Couples, Families, Maternity, Newborn & High School Seniors. There doesn't need to be a special occasion or a certain family size to book a lifestyle session - everyday is a special and capturing your relationships is always perfect reason. Where will we take your photos? Well it depends on you! Lifestyle sessions can be held in a variety of locations - from curled up in your favorite spot in your home or a sunlit field or surrounded by trees. Together we can decide on a perfect location for you and your loved ones based on your personalities and personal style and preferences. Do you offer studio newborn sessions? Since my focus is lifestyle photography, all newborn sessions are held in the comfort of your own home. I do not work out of a studio. Your home is the perfect backdrop to capture the connection and love in your family because its where your baby's first days actually occur! Do you offer posed newborn photography? Any themed sessions? I do not offer posed newborn photography, cake smashes or any themed sessions. For couples, families and seniors, I book 2-3 months out, so be sure to plan ahead. For maternity and newborn sessions, please contact me as early as possible. 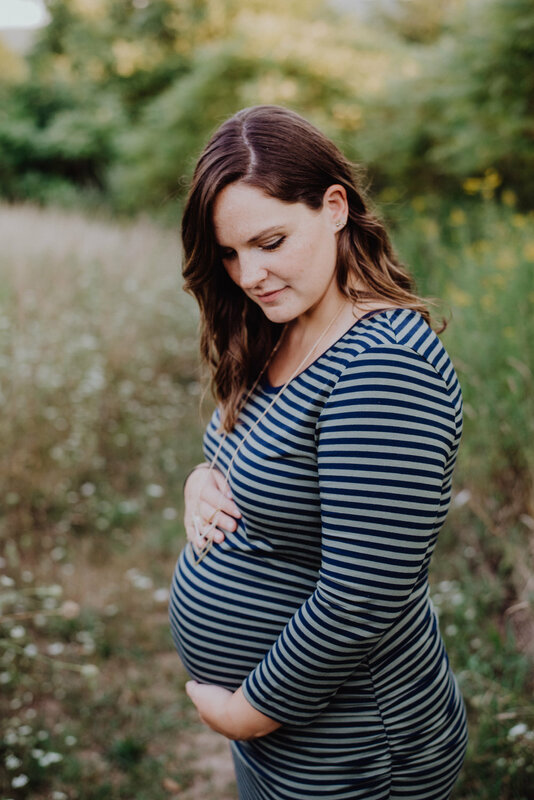 What's most important about you maternity session is you feeling comfortable. Most mommas-to-be prefer somewhere between 28 and 34 weeks - when they look pregnant but still feel comfortable. How and when do I receive the digital files? All sessions receive an online gallery of 25-100+ images, usually around 2-3 weeks after your session. Depending on the size of the package you choose, you will be able to download full resolution digital files from an online gallery, as well as a print release. Are you willing to travel for sessions? Yes, yes, absolutely yes! We include travel into our collections up to 40 miles. But we LOVE to travel and would happily customize a package to include any additional travel cost! There's a Pinterest page for that! Click here and check out the "What to Wear" boards.